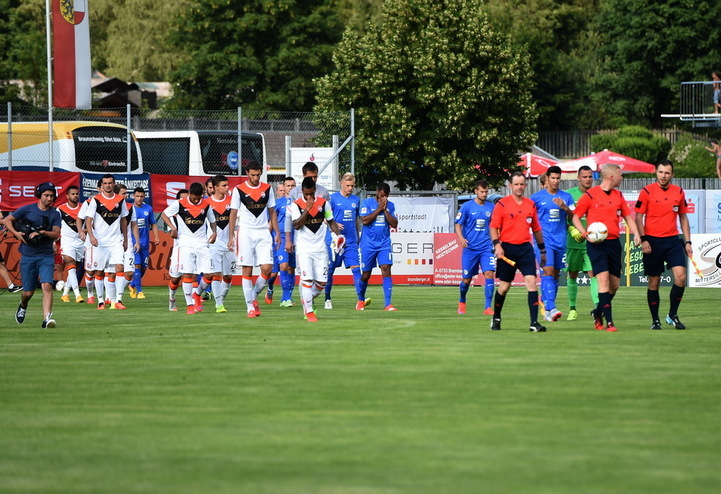 On July 2, the Pitmen held a training game with the German side Eintracht. The Pitmen’s head coach continues giving match practice to youngsters, as well as giving opportunity to those who spent less time on the pitch during the past season. Of the team’s first team squad, only Alex Teixeira was featured in the starting line-up. The Brazilian player took part in all three matches of the training camp in Austria. The Pitmen took control of the game straight from the start and organised positional attacking moves. The German relied more on counterattacks and operated from the back. It should be said – quite successfully. On 16 minutes, Tsuk bore down on goal, but Kanibolotskiy played confidently while rushing out of goal to cover the ball. The opponents continued creating dangerous situations, and on the stroke of the first half Ofosu-Aye beat Wellington inside the penalty area before planting an accurate shot into the far corner of the net. The opposition took a 1-0 lead. After the break, both teams changed the squads almost entirely. Experienced Srna, Rakitskiy, Shevchuk, Stepanenko and Hladkyi came on for the Pitmen. As a result, Shakhtar fully took control of the game. And the number of the opponents’ counterattacks became fewer. But the German side were on target when it came to converting chances. On 67 minutes, Duker capitalised on the Pitmen’s defensive error to bear down on goal and score a goal. After six minutes, Vrancic had a good chance – the ball flew just some centimeters away following his powerful shot. Rakitskiy responded with a powerful effort from distance – the ball flew just wide of the top corner. In the following attacking move, Kobin played well on the rebound to fire a first time shot from a fifteen-metre range. The ball flew into the right bottom corner. Bolbat had an opportunity to net an equaliser. Serhiy skipped past two defenders, but sent the ball over the crossbar. In the final minute, the referee awarded a penalty kick against the German side: the defender handballed after a flick-on from Hladkyi, but the referee awarded a corner-kick. As a result, Eintracht managed to hold onto a 2-1 win. We would like to remind you that on 4 July Shakhtar will face Lechia Gdansk in Poland in the LOTTO Lubelskie Cup.